I am sharing my favorite recipe for cabbage stir-fry made Indian style – it is super easy to make. 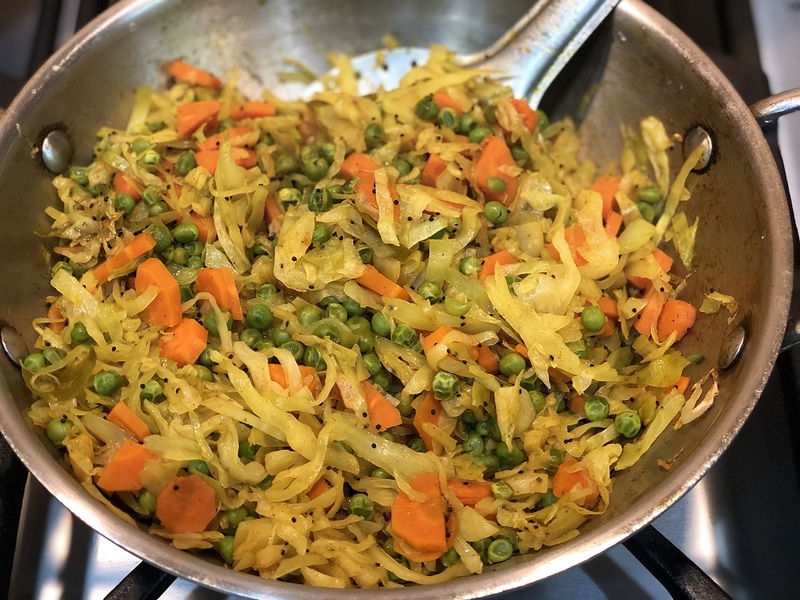 The combination of green cabbage with carrots and peas makes this dish so colorful and tempting. The spices bring out a flavor that is hard to resist. You can adjust any of the spices listed in the recipe below to suit your taste. Heat olive oil in a skillet. Once hot, add all spices except salt and sauté for one minute. Add all vegetables and mix well. Add salt. Cover with a lid and cook on medium heat with occasional stirring every few minutes. Lower the heat or sprinkle a few drops of water if the mixture sticks to the bottom of the skillet. Cook until the vegetables are cooked to desired tenderness. I like it well done. Fill it in a whole-wheat pita pocket with a side of plain yogurt. Put it on a whole-wheat toast and broil for a few minutes until the top portion is roasted. Makes a great breakfast toast if you have leftover from before. I also like to add a slice of cheese under the cabbage before broiling. Wrap in a whole-wheat tortilla with a sprinkle of hot sauce for a snack. Eat with an Indian style bread, chapatti or roti with a side of lentils.